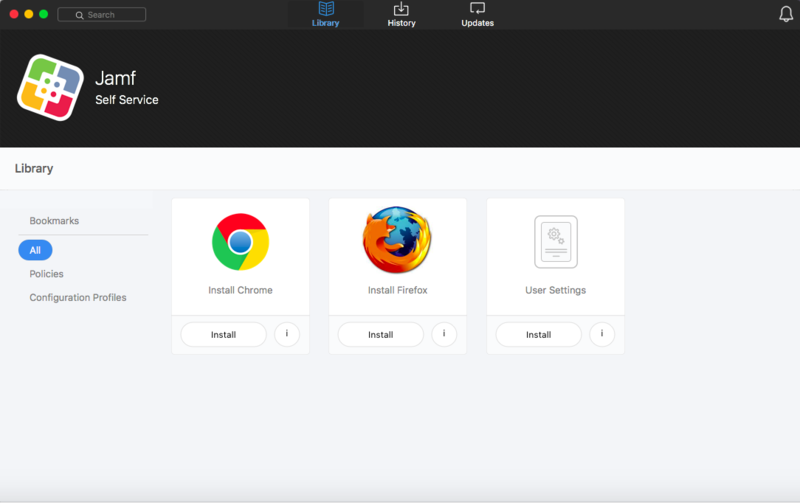 The Jamf Self Service for macOS application allows users to browse and install configuration profiles, Mac App Store apps, and eBooks. Users can also run policies and third-party software updates via patch policies, as well as access webpages using bookmarks. You can make any configuration profile, policy, software update (via patch policy), Mac App Store app, or eBook available in Self Service and customize how it is displayed to users. This includes displaying an icon and description for the item, including the item in the "Featured" category, displaying it in relevant categories, and displaying item-specific notifications. You can also specify which computers display the item in Self Service and which users can access it.